The main objective of the project Passport to Export is to increase the number of internationalized SMEs in the border area, especially for technology and innovation-oriented companies, as for the economy and technology providers in the program area, where sustain international growth and export markets are open. The project focuses on supporting the development of new products and the internationalization of technology based companies in the developed regions Switzerland and Italy. The consortium partners come exclusively from the eastern part of eligible areas where they don’t have opportunities to participate in bilateral programs with SUI and ITA. To support at least 24 companies in the process of internationalization regarding developed markets (Switzerland and Italy). Placing products and services of the two partner companies (Slovenia and Austria) on both markets. 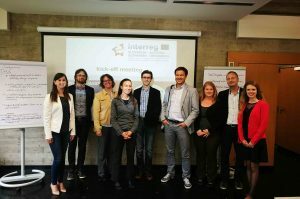 Develop, test and establish a sustainable working structure together with strategic partners from Lombardy, Emilia Romagna, Veneto, South Tyrol and Switzerland.